Share your photos of the Perseid meteor shower with us on CNN iReport, like this one from Greg Ochoki in 2011. Hundreds of shooting stars and fireballs will fill the skies over the northern hemisphere on Saturday and Sunday night as Earth passes through a stream of debris from the Comet Swift-Tuttle - otherwise known as the Perseid meteor shower. The Perseids have presented a scintillating display for 2,000 years, according to NASA. The comet Swift-Tuttle orbits the sun once every 133 years, which means that every August, the earth passes through a the comet's debris field. The ice and dust, accumulating over a thousand years, burns up in our atmosphere to create the meteor shower. This year's display will be even more awe-inspiring than years past because the brightest planets in our solar system will be in the middle of it all. Jupiter, Venus and the crescent Moon will align as the shower peaks. And just as the shower is beginning to wane on August 13, the planets will be at their brightest, according to NASA. The meteor shower will peak on the night of August 12, with at least a hundred shooting stars visible per hour. 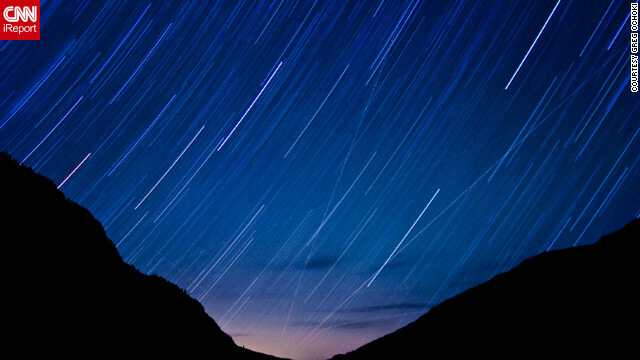 NASA scientists advise that although they can be seen any time after 10 p.m., the best time to spot a flurry of meteors will be during the darkest part of the night, in the early hours before dawn. If you live in an urban area, you might want to drive a little ways to avoid the distraction of the city lights, which can make the meteor shower seem faint. Scientists from NASA also said that camping out in the country can triple the amount of visible meteors. Thinking of counting all of the shooting stars? If so, NASA would like for you to let them know. They have developed an app for the Android and iPhone that allows stargazers to count every meteor they see, and report the results in a scientific way that will be valuable to NASA. The data will allow scientists to study and model the debris stream of the meteor shower. If you already plan to stay up all night in anticipation of the meteor shower, join the online chat with astronomer Bill Cooke and his team from NASA's Marshall Space Flight Center on Saturday night. From 11 p.m. to 3 a.m., ask them your burning questions about the meteors filling the night sky. And don't forget to grab your camera before you head out. Meteor showers are a great opportunity for time-lapse videos and long-exposure photography, allowing your shots of the night sky to turn into van Gogh-like paintings of this starry spectacle. Share what you capture with us on CNN iReport and your photos and videos could be featured on CNN.